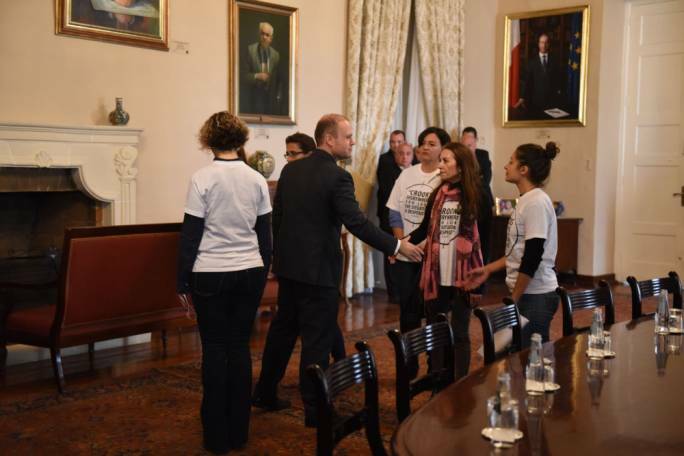 Activists from the Occupy Justice movement have met with Prime Minister Joseph Muscat, three weeks since the assassination of journalist Daphne Caruana Galizia. Four representatives from the women’s movement formed in the aftermath of Caruana Galizia’s murder, met with Muscat and justice minister Owen Bonnici where they demanded the resignation of Commissioner of Police Lawrence Cutajar and Attorney General Peter Grech. The demands, also shared by the Civil Society Network and the Nationalist Party, reflect their view that a culture of impunity had created the conditions that led to the execution of Caruana Galizia by a car bomb, on 16 October. “If you ignore our wishes, you will be remembered as a prime minister who took advantage of his position,” the activists told Muscat in a statement they read out at the Auberge de Castille. They also accused Muscat of “controlling the institutions” and compared Malta to Hungary’s illiberal administration. Muscat replied to the activists that the police chief and the AG could only resign if there was a majority consensus in favour. “His [the AG’s] resignation would be unlawful because there is no political, moral or legal basis for this to be done,” he said, quoting the law that regulates Grech’s security of tenure. 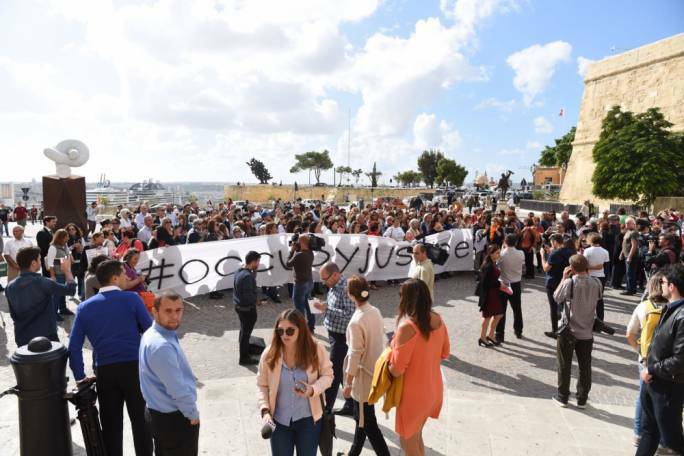 He also said he disagreed with Occupy Justice’s evaluation of the state of the country, and that he wanted to see the Caruana Galizia case solved. He also agreed that changes to the Constitution were necessary. 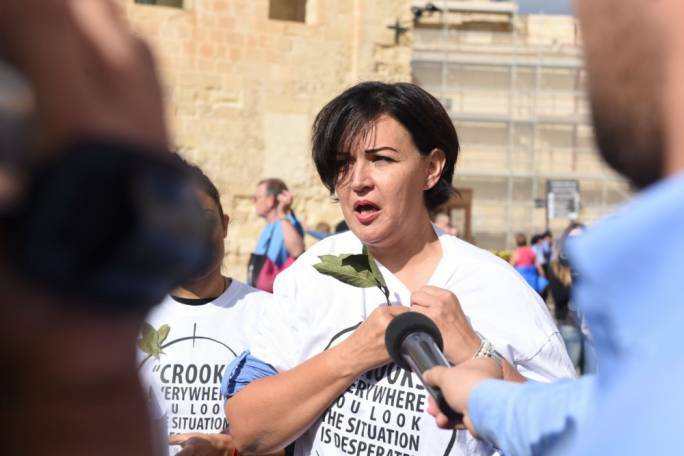 Later, the prime minister’s spokesperson Kurt Farrugia said the activists refused to speak to Joseph Muscat informally after the press was escorted out of the office. “Muscat invites #OccupyJustice activists to his office in an event open to all media. They call him an autocrat in a pre-written statement. When cameras are off and journalists out, PM invites them to continue discussions. They reply they have nothing more to say,” Farrugia said. Farrugia also took issue with the activists' decription of Muscat as "autocratic" in a tweet. "An 'autocratic' Prime Minister which invites protesters to discuss the issues they are protesting about in his own office in the presence of three ministers. #OccupyJustice had nothing more to add to a pre-written statement. @MaltaGov open for discussions." Outside on Castille square, women activists held out a banner and chanted slogans calling for the resignation of the police chief and AG.